Are We 'Clean Eating' Our Way to Illness? Recently asked by Dr. Oz, "What is clean eating?" I replied, in so many words, "Being more mindful about the foods you choose and focusing on a diet that is comprised of whole fresh foods (e.g., fruits, vegetables, whole grains, legumes, nuts, seeds, thoughtful animal foods, and healthy fats)." Plus many more tips that you can read about here. While it seems pretty simple, many have either a hard time understanding and navigating the concept (rightfully so) while others perhaps take it way too far. "I never eat fruits with my vegetables because I heard that combining them is bad for my health. Is this true?" "I was told that I should never eat grains without rinsing them, even soaking them. It's too much fuss so I don't eat them. Is that OK?" "What spatula do you recommend? I just bought one made with silicone and I am scared to use it." "My friend convinced me to go vegan because it is healthier for me but I am craving animal foods. What do I do?" "My supermarket doesn't carry any organic fruits and vegetables so my choices are limited. I only buy organic so I am afraid that I am not getting enough nutrition." "I know sugar is bad so I only consume stevia. Is that healthy?" Post session, our hearts sank as we realized how much fear our students had. Our work for the week was cut out for us! 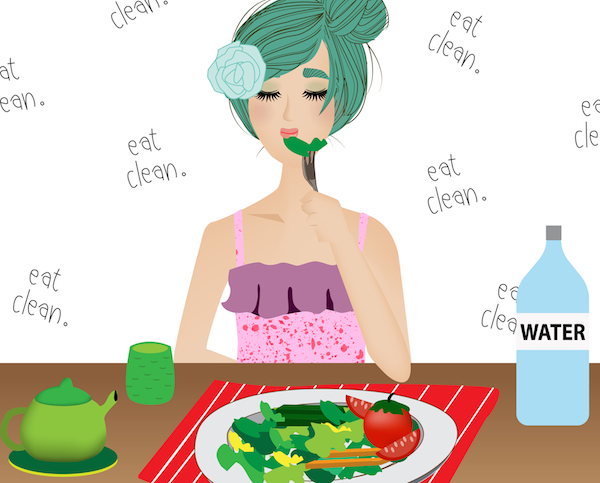 Speaking of taking clean eating too far, I recently came across "We Are Clean Eating Our Way to New Eating Disorders." According to the author: "Because overdoing it is the American way, we've now managed to warp even healthy habits into a new form of eating disorders. Welcome to the era of orthorexia." Fresh is Fabulous -- consume whole fresh foods 70-80 percent of the time. Pick and Choose Your Processed Foods -- the ingredients tell the story of your food. If they read like a short novel or you can't pronounce an ingredient, don't buy the food. And avoid anything artificial (and for far more detail on this, you can pick up a copy of my book, What The Fork Are You Eating?). Culinary Corner Cutting -- getting in the kitchen is key so if you can't rinse your grains, don't. If you can't soak your beans, don't and buy canned. Focus on what you can do and just do it! Eat What Nourishes -- always know that some vegetables are better than none. And enjoying what you eat truly nourishes mind, body and soul. So if you prefer white rice to brown, definitely dabble in the white. Have fun -- turn a little music on as you prepare a meal and connect to your inner cook while you nourish yourself and those around you. If you can take these five simple steps then you are on the road to getting healthy and staying healthy. Don't forget that the fear alone can lead to illness. Food is emotionally loaded, I know this firsthand -- personally and through the many clients and students I have the great pleasure of working with. But please take a deep breath, stop listening to the nutrition noise and get a real edible education as with that, many of your fears will subside. To stay connected with Stefanie, sign up for her blog -- bi-weekly ruminations, radio shows and recipes, and follow her on: Facebook, Twitter, and Instagram. Her book, What the Fork Are You Eating? (Tarcher/Penguin Random House) is available wherever books are sold.